The best part of homeschooling high school is engaging in fun and meaningful activities beyond academics. When not confined to a public school desk for many hours each day, children have time to discover and explore their passions! High school activities are important, not only for the joy the experiences create, but also the impression they will leave with colleges and future employers. 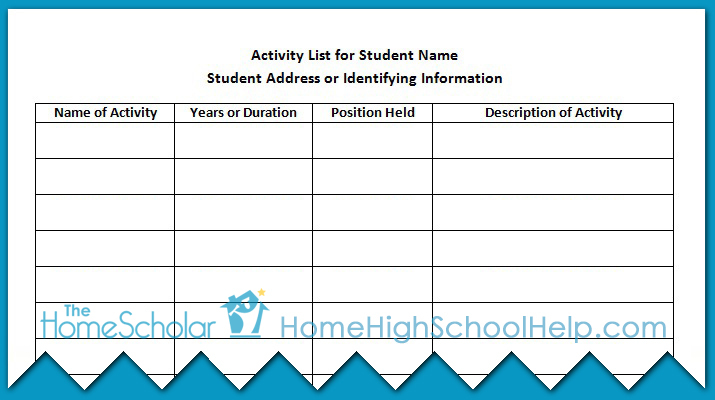 A list of high school activities becomes part of a comprehensive college application package, and can be included on their resume for a job search. This will be a pretty handy list to have! There are two steps to making this perfect list with your perfectly normal children. First, you have to figure out some activities. Second, you have to put them on a list. Easy-peasy, right? Let me show you how, and give you plenty of hint and tips. 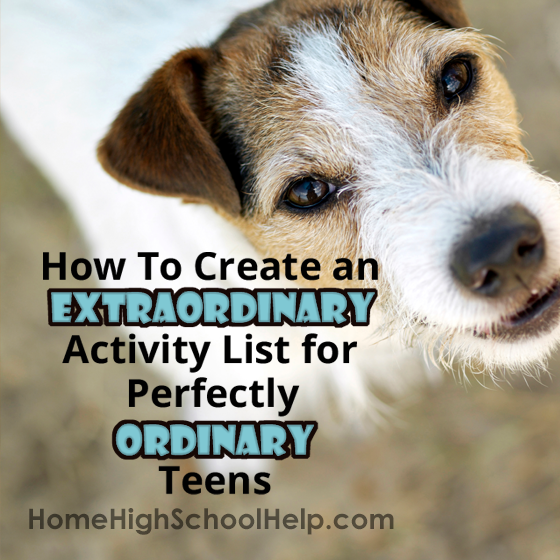 I’ll even share a super-long list of ideas to help you brainstorm activities for your own perhaps less-than-motivated teenager. 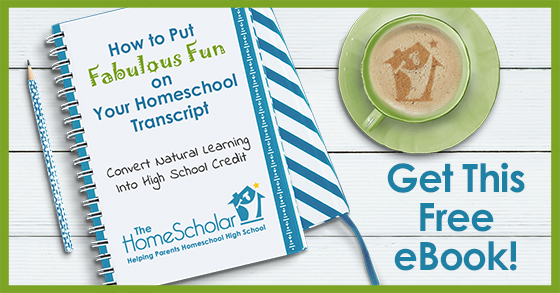 Learn how to put homeschool activities on the homeschool transcript with this free ebook. I can teach you how to turn your teens passionate interests into high school credit. Your teen will have fun while you build a dynamite transcript! It's a win-win. What could be better! 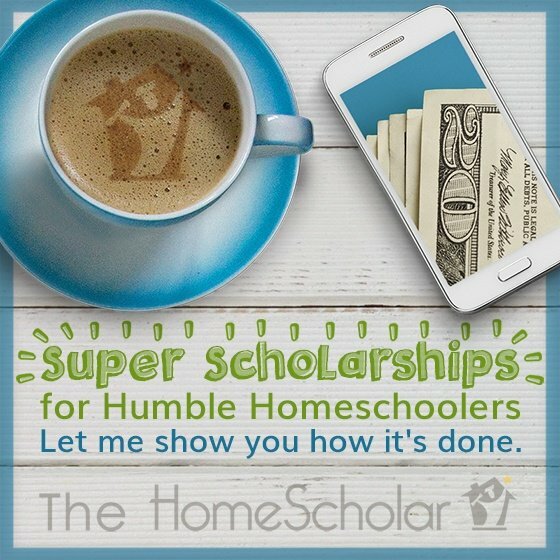 Sign up to instantly download "How to Put Fabulous Fun on Your Homeschool Transcript: Convert Natural Learning into High School Credit"
Not all children are naturally sociable and outgoing. Some are naturally quiet. If you have a child who seems to do "nothing", finding things to put on an activity list can be a big challenge! Sometimes the child isn’t shy, but may have a family situation that makes building connections difficult. Some families, like our faithful military families, move frequently. Finding new friends and new activities in different locations every few years can be difficult. Yet, colleges will still want to see an activity list. Let's consider ways to find activities, because writing "nothing" on that application is not a good option! Activities can be extra-curricular, either before or after school work, or done during the summer. They can be athletics or team experiences. They can include hobbies or special interests. It might be employment, or volunteer work experiences or internship. It can include awards and honors received. It might be community involvement, or charitable work. It can be activities done only during the summer or year-round. 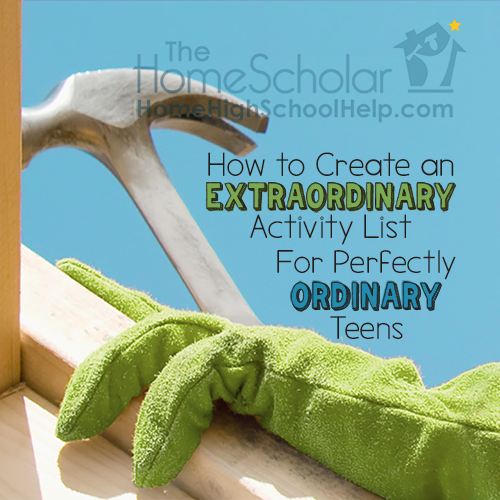 Your activity list should mention only things the student did after completing 8th grade, and before high school graduation. What does your child do for fun? If you think through each interest, you might find some great ideas for the activity list. For example, one of my children was constantly studying chess, and it helped me remember to put his chess experiences and awards on the list. Think about what they do for fun, and brainstorm everything you can think of that they do around their passion. You may just strike it rich in activities there! What do you do in the evening as a family? What do you do on Monday night? Wednesday night? Sunday morning? Each of these family activities might be something that could be listed as an activity. If you volunteer at a food bank, does your child go with you? Put that on the list. Do you attend church together, and your child goes to Sunday School or the weekly youth group? Put "Church Youth Group" on the list. Sometimes your transcript will give you a clue to activities. If speech and debate is on the list - that's an activity, so include it on both the transcript and the activity list. Judo is a skill - put that on the activity list. Sometimes PE class will involve an organized sport, or your fine arts class might involve an after-school theater group or club. Go over that transcript with a fine-toothed comb! I was involved in Choir when I was in high school. I received a high school music credit for Choir, but it was also included as an activity on my transcript. What has your child done that has made Grandma gasp? What did you put in your Christmas letter last year? Those memorable moments may include long-forgotten activities or awards. A shocking story that you told Grandma has not usually taken place in the quiet of your living room. Can that be a source of inspiration? One simple way to create your own activity is to have your child teach what they love. If they love Tae Kwon Do, they can ask their instructor for a job as a student teacher. An art-lover can volunteer to teach art to a group of friends. Your child can offer to teach classes at the local YMCA or community center. They don't have to be gifted at the subject, they just need to be willing. Search your community for ways you can volunteer as a family. Does your community have a food bank, clothing bank, or Meals on Wheels program? Volunteering together as a family is a wonderful way to develop an activity. Does your church have a choir? Perhaps your child would like to sing in the choir, or help lead worship vocally or with their musical instrument. Or perhaps they would like to take that musical instrument to a Senior's Center and play for them. Have you gone on a mission trip as a family? Don’t forget to add that to the list! Are you raising and/or training service dogs? Other places you can get involved in volunteering include: the United Way Youth Council, 4-H Teen Ambassador groups, Lions/Rotary/Kiwanis clubs, Animal Shelters, or your local library. Each college or employer will have a different way of asking about your activities, so the more detail you include, the easier it will be to fill out forms later on. Employers might want this information in the form of a resume, and colleges may use the Common Application, or have their own forms to fill out. As long as you have the information you need, you will be ready for any requirement in the future. When you are working on college applications and they ask for information on activities, you will have everything you need at your fingertips. That can be such a relief during the “crunch time” of senior year. Here are some websites for finding volunteer activities to do as a family.Here are some websites for finding volunteer activities to do as a family. 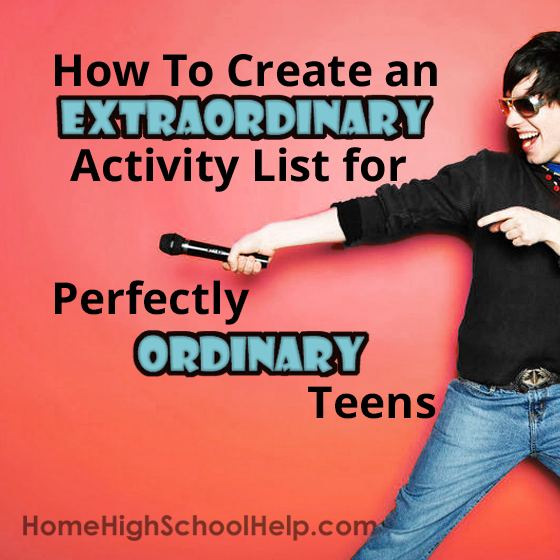 When all else fails, and you can’t think of any activities, check out this long list! Remember that imitation is the sincerest form of flattery. Ask your friends! Look around at what other homeschoolers are doing for volunteer, leadership, and community service activities. I asked for some ideas on Facebook, and there were tons of very helpful suggestions. Here are some websites for finding volunteer activities to do as a family. 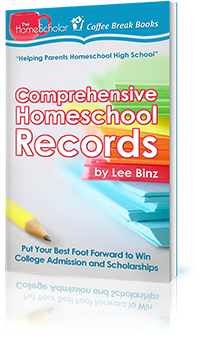 A comprehensive record is your high school records organized in a neat, easily digestible format that colleges will understand and appreciate. 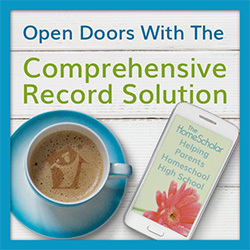 The Comprehensive Record Solution will guide you every step of the way for the development, creation, and presentation of your student’s Comprehensive Record. I think probably the BEST thing I can say about it is it has everything I wished I had when I was putting my own records together.